Utility and design patents on a modular storage container adapted to hold cosmetics or other small items in a stylish and sleek way is provided. The modular storage container can include a base unit having a first side and a second side, one of a mirror and magnifying device being arranged on the first side of the base unit, an illumination assembly for illuminating the mirror, and a removable cover. The removable cover can be adapted to secure to the first side of the base unit and to protect one of the mirror and magnifying device in a first secured position of the cover. The second side of the base unit is capable of being secured to one or more of a plurality of modular storage units in a stacked relationship. The second side of the base unit can be capable of being secured to the cover in a second secured position of the cover. The patent allows for containers, cases, packaging, etc to be stacked or added together. The lighting design has technical features that offer a multitude of possible functions. There are multiple potential uses including: makeup; contacts; fishing lures; medications; sewing and other small mobile items to go. With flexibility in the size of the item built into the design and utility patents, the uses can extend to various item sizes. For example, tool kits for mechanics, carpenters, plumbers, electricians, etc. We have a visual marketing packet that can be shared based on interest level. We are interested in putting our patents into the marketplace and are flexible in business and financial arrangements. 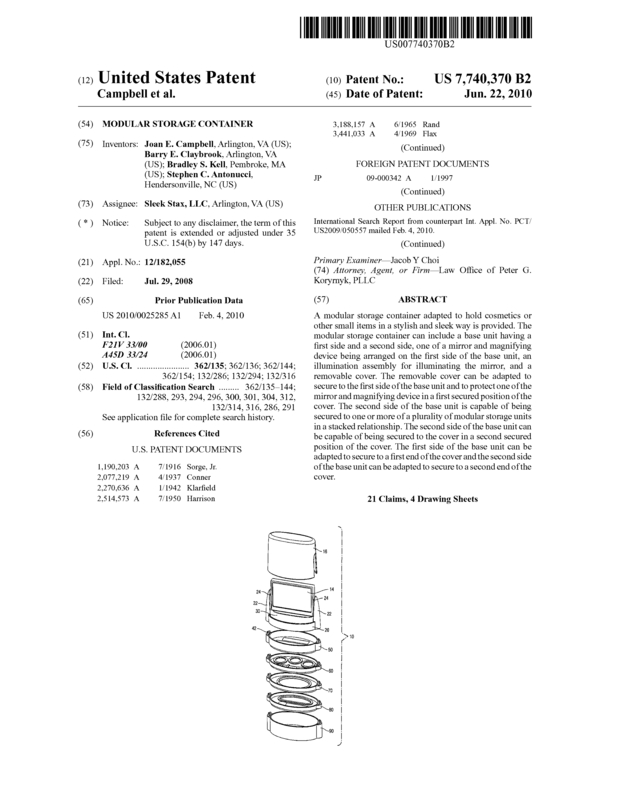 Page created at 2019-04-22 14:09:45, Patent Auction Time.